Despite the weak 160 meter signal reported by some, this band offered the best Doppler free source, with 9 sub 10 mhz readings. Both 80 meter signals had considerable Doppler, with most stations reporting the frequency on the low side. KK8O OH EN80or First try with a new receiver. W6OQI LAX DM04vf K5CM signal on 80 meters was S9 with usual doppler but not the worst I have seen here in Southern California. The K5CM signal on 160 meters was weak and hard to find. N8OB OH EN80ko 80M had very good sigs. 160M was very weak here. 40M was weak also. Fun as usual. N2GL OR CN85ko HP3335A diciplined by HP Z3816A gps reference.706mkIIG rx with SpecLab reading 500Hz beat. QRM thru wide AM filter. Poor conditions except great signal on 80 from W6OQI. Never identified 160m signal. Thanks for the FMT Connie and Charles! W9ZB IN EM69 Strong sigs from K5CM with some QSB on 160. Weak but usable 40M from W60QI, 80M a little better, also with QSB, but fun! TNX guys. KØMZ KS EM28ix Great job tonight, Connie and Marvin. Connie's 80 and 160 meter sigs were very strong in KS. 80 had some doppler while 160 had very little to my ear. Marvin's 40 meter signal was just above the noise level in KS. His 80 meter signal was S7 with QSB. All match pitch tuning by ear. SX-73 receiver worked the best tonight except for Connie's 80 meter signal received on Atlas 210-X. Great evening for a fun FMT. N5DM STX EL29fs Kenwood TS-480 and DigiPan v2.0. Minor doppler all signals. Thanks K5CM/W6OQI. AB4RS VA FM18hw Had great copy on K5CM signals, but recorded sound files are blank. AARGH! Going by notes and recollection, but will be lucky to be within 10 Hz. W6OQI was weak but readable, should do much better there. Used HP3336C referenced to Trimble Thunderbolt. Injected known reference signel, tuned RF using Yaesu FT897d, and SpectrumLab to analyze the audio to determine the offset. K6OQK LAX DM04ud Connie's 80-Meter signal was very strong but I had trouble tuning in his 160-Meter signal. I could hear the call-up going in and out of the noise, but when the steady carrier came on I was able to glom onto what I hope was it. Marv's 40-Meter signal was nice and steady, but his 80-Meter signal had quite a bit of Doppler for being only 8 miles away. My normal 210' span Inverted-V is down right now and I only have a 60' span dipole about 5' above the garage roof; not real good on 160-Meters. Again, thanks to Connie and Marv and to Pam and Herta for loaning us their mates for another fun filled evening. WA2DVU SNJ FM29ob Hi Connie, I think your ack reverses the band=fx readings! Thanks again for the test. VE2IQ ON FN15nt Good sigs, routine. Did not try to outguess Doppler, let computer do all the work. Spreads tight so I may be OK. Thanks for another great test. K6BZZ AZ DM33xb Lots of frequency shift on K5CM 80 meter run. A nearby JT-65 signal was in there too. 160 mtr sig good. W6OQI weak on 40 and loud on 80. Interesting conditions. Thanks for running the tests. Always fun and challenging. WB6RQN SV CM98mq This is my first time trying this. The 40m sig was very weak at my QTH, probably not more than about 4dB S/N. I couldn't fully copy the CW and couldn't tell exactly when the test signal cut off but the data looked pretty good anyway. 80m was *much* stronger (+30dB) with a lot more frequency variation. Just looking at the variation patterns is intriguing. It is hard to estimate a frequency to 1mHz when the variation is over 800mHz! Doing this is NOT as easy as it seems like it should be. :-) I'm hooked! K6HGF LAX DM04 No copy on Connie's 160 meter signal. Thanks to Connie and Marv for another FMT. K9KK OK EM15 My wonderful PC crashed in the middle of the run so results are highly suspect. Used GPS disciplined HP3336B RF generator for reference Frequency and Spectrum LAB to compute the DELTA. K5XL NTX EM12kp Signals were strong enough but the doppler on W6OQI was nasty! Equipment: FT-1000mp with TCXO calibrated to local GPS locked AM station KFLC 1270 Fort Worth TX. Measured audio hetrodyne freq with SpecLab on computer with Sound Blaster Audigy soundcard calibrated to WWV 500 hz standard tone. Thanks to K5CM and W6OQI for the FMT. 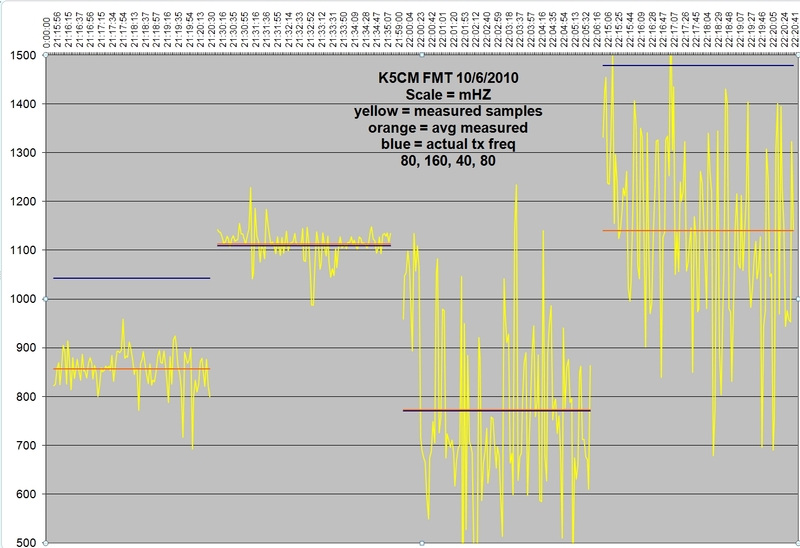 KD2BD NNJ FN20xd The Kp-index hovered around 2 around the time of the FMT, a decline from 3 earlier in the day. Connie had a fairly good signal into New Jersey on 80, and a somewhat weaker (but usable) signal on 160. Marvin was in and out of my noise level on 80, making accurate measurements difficult at best. Thanks to all involved for making this FMT possible. K4COD GA EM73sd This is my first attempt at an FMT. I've spent quite a bit of time learning, calibrating, and planning. I hope that I did fairly well. The doppler effect was a real problem. I used a Yeasu FT-1000MP Mark V Field, calibrated to a local GPS locked AM broadcast station. Used the Spectrum software for measurement. Thanks for running the tests. K1GGI EMA FN41wr Usable signals all around. Thanks guys. AA8K MI EN82sx Peak signal levels received in dBm: K5CM 80M -82, K5CM 160M -91, W6OQI 40M -77, W6OQI 80M -94 WWV 2.5MHz -84, WWV 5MHz -62, WWV 10MHz -84. Antenna: ground-mounted vertical 20 meters high. I used only Open HPSDR, Thunderbolt GPSDO, and Spectrum Lab. I offset HPSDR about 500 Hz to make an tone with its BFO, used PowerSDR to make a wave file. Play the wave file back and run Spectrum Lab, note the offset from the HPSDR frequency. W1PW AZ DM33 Thanks Connie and Marv for these tests. Missed the W6OQI 40 Meter measurement due to an unexpected, but important phone call(!) Equipment: Trimble DGPS,FT817nd, SL v2.75, Excel worksheet. I've attached a graph of my results from this test. The scale is in millihertz and depicts the audio beat note measured by speclab when the radio is tuned about 500 Hz from the carrier. The dark blue line is your reported tx freq and the orange line is my measured average of the samples (yellow). I am amazed at the 80 meter results vs. the other bands. My 80 meter results are .2 to .3 hertz off. Can Doppler have this much effect for the entire 5 minutes? I shouldn't be too surprised as I see this with WWV regularly. A HP Z3801 GPS frequency source clocks a HP-3336B. A 10 db transistor amp follows and drives a 12BY7 / pair 6146. Then to the final amplifier, a Dentron 2500 running 350 watts out on 160, and 80 meter. There are no mixers or any device in the chain of amplifiers that might impact the accuracy of the GPS frequency source. As a reality check, I periodically log the frequency source against WWV and other GPS referenced sources. I monitor each transmission with a completely separate receive system to look for any instability or short term drift. The separate system is not locked to the GPS transmitting system, but to another GPS source. I typically see considerably less than 1 mHz difference at 10 Mhz when comparing two Z3801's or a Z3801 and a Thunderbolt, over a 10 to10,000 second period.